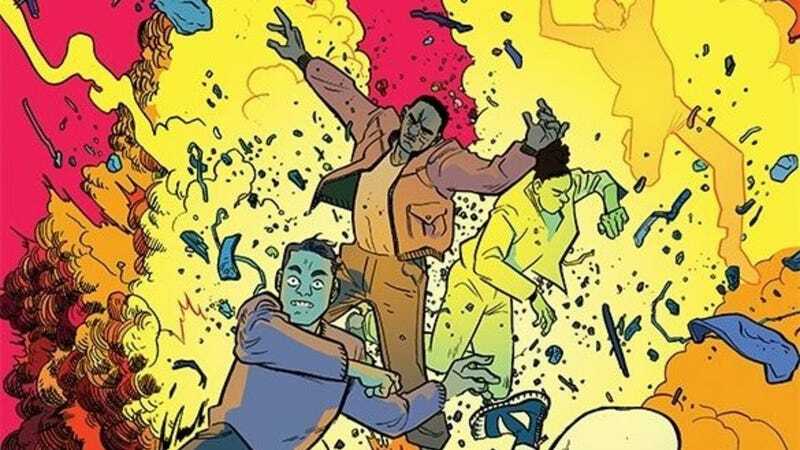 Image Comics and Skybound’s new series, Assassin Nation, debuted with guns blazing, introducing 20 of the world’s top killers and pitting them against each other in a bloody firefight. Written by Kyle Starks with art by Erica Henderson and letters by Deron Bennett, this comedy-infused action series is brimming with personality to enrich its bombastic battles. Kyle Starks has built a reputation on telling engaging, exciting stories about hired killers in books like Sexcastle and Kill Them All, and Assassin Nation ups the scope of the storytelling as it introduces a squad of murderers tasked with protecting a former hitman turned mob boss. Erica Henderson is coming from a very different background: She’s a two-time Eisner Award-winning artist known for kid-friendly series like Jughead and The Unbeatable Squirrel Girl. But those series honed her character acting and fight choreography skills, making her an ideal collaborator for Starks. This exclusive preview of next month’s Assassination Nation #2, on sale April 17, delves into the history of the individual hitmen as they recount their first kills, offering quick flashbacks that provide a lot of context for their characters. The nature of these deaths is very different: retribution for crimes committed against the future assassin or someone/thing they care about, military action, self-defense, even childbirth. The economy of storytelling here is very impressive, with the creative team packing a lot of material in four-panel flashbacks that function like small comic strips in the page. Henderson is coloring herself on this title, and she uses a different palette for each memory to make it specific to each character’s experience. Henderson separates the Mamba Twins from the other killers by breaking the format for their story, using three wide panels and incorporating an expressionist background to reflect their strange, creepy perspective. The creative rapport between Starks and Henderson is electric, and as the series continues, it delves deeper into the inner lives of the killers to add complexity to a thrilling narrative.